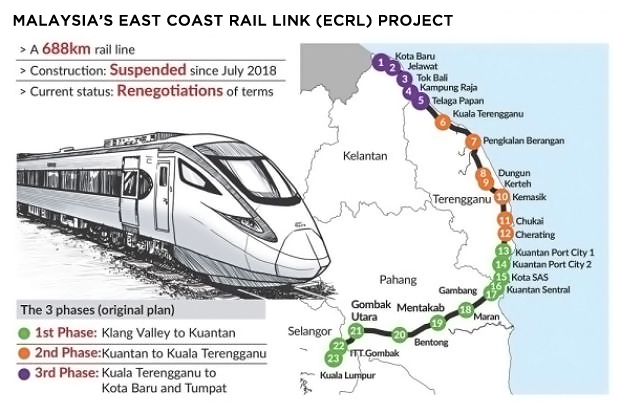 (8 April 2019) Ongoing re-negotiations of Malaysia’s Chinese-backed East Coast Rail Link (ECRL) project could see the overall construction cost lowered from the initial US$13.4 billion (RM55.5 billion) to between US$8.4 billion (RM34.4 billion) and US$10.1 billion (RM41.3 billion), according to The Star report quoting unnamed sources. This will be done by lowering the per kilometre construction cost to around US$12.2 million (RM50 million) for tunnelling on normal terrain and US$14.7 million (RM60 million) for tunnelling in critical areas and areas with challenging soil conditions. Additionally, the re-negotiated contract could include a commitment from China to buy more Malaysian palm oil and more direct Chinese investments into Malaysia. CIMB Research estimates that based on current prices, every 5% increase in palm oil exports could help Malaysia increase its current account surplus by US$488.2 million (RM2 billion) or 0.14% of the country’s GDP. (3 April 2019) The Philippines’ trade secretary Ramon M. Lopez urged the country’s producers to diversify their exports to China to help bridge the trade gap between the countries, according to a BusinessMirror report. Lopez was further quoted in saying that he not only wants to increase bilateral trade between the countries, but hopes to do so by elevating the type of products that the country exports to China to higher-value goods such as high-end furniture, automotive parts and electronics. According to Lopez, there is “great demand” for Philippine products and local producers need to step up their production of agricultural and manufactured goods in order to meet this demand. Figures from the Philippine Statistics Authority (PSA) show that the country’s exports to China increased by 8.48% from US$8.01 billion in 2017 to US$8.69 billion in 2018 while its Chinese imports grew by 22.5% from US$17.46 billion in 2017 to US$21.39 billion in 2018. Furthermore, its trade gap with China went up from US$9.45 billion in 2017 to US$12.7 billion in 2018. (8 April 2019) Malaysian sugar heavyweight MSM Malaysia Holdings Berhad is reportedly close to finalising partnerships to export its products to China. The move comes as MSM — the world’s sixth-largest sugar refinery — looks to tap the growing Chinese consumer market to bolster its dwindling performance in recent years. MSM executive director Khairil Anuar Aziz was quoted by Bloomberg in saying that the company hopes to meet the demands of the “new generation” of Chinese consumers by supplying sugar for the manufacturing of popular eatables such as bubble tea, health drinks and baked goods. According to the OECD, China is set to become the world’s largest sugar importer by 2027. Furthermore, Euromonitor International projects the country’s snack consumption will rise by 13% to reach 13.5 million tonnes by 2023. (8 April 2019) KLN (Singapore) Pte Ltd, a subsidiary of Hong Kong-based Kerry Logistics, has signed a memorandum of understanding (MoU) with Laos’ Sitthi Logistics to establish a joint venture to develop a dry port in the Vientiane Logistics Park in Laos. According to Post and Parcel, Kerry Logistics will contribute its management expertise, while local player Sitthi Logistics will contribute on-the-ground support. The 35-hectare project, to be used for the transfer of cargo at Vientiane, comes as part of the Lao government’s plans to incentivise commercial developments that help the local economy benefit from the Kunming-Bangkok rail project running through Vientiane, in the hopes of establishing the city as a major economic hub under the Belt and Road Initiative. The MoU signing ceremony held on April 5 was attended by Lao Deputy Prime Minister Sonexay Siphandone. (8 April 2019) As part of its wider plan to deepen bilateral cooperation with China, Singapore plans to establish the Singapore-Shanghai Comprehensive Cooperation Council. The council will enable the two countries to intensify cooperation in the development of the Yangtze River Delta region. The plan was revealed by Singaporean Deputy Prime Minister Teo Chee Hean in a recent op-ed in China’s Contemporary World Magazine titled “Singapore-China Friendship: Moving Forward Hand-in-Hand from Generation to Generation”. Furthermore, Teo mentioned in the op-ed that Singapore will embark on “new initiatives related to legal and judicial cooperation for commercial transactions.” The op-ed was published ahead of the Singapore-China Forum on Leadership to be held on April 14 and co-chaired by Teo and China’s Minister of the Central Organisation Department, Chen Xi.